Facebook is a great place to find foodie inspiration. 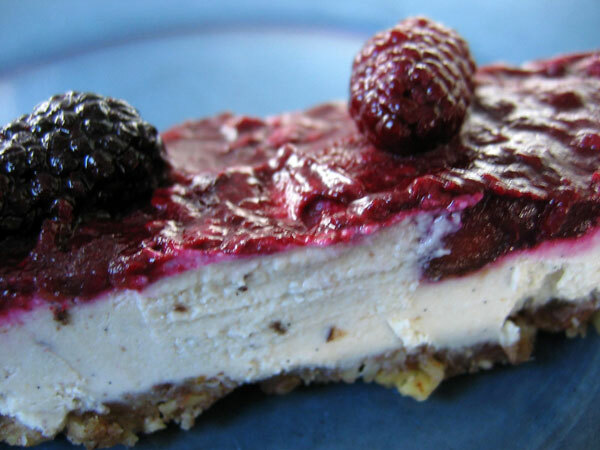 Recently, my FB friend Natasha Jamison posted photos and a recipe for a raw cherry “cheesecake” and I knew I had to adapt it, using the organic blackberries I had just purchased. There is actually no dairy used – the “cheesecake” is a mainly cashew filling, with vanilla bean, lemon juice and natural sweetener. Yum!! Natasha found the original recipe on a raw foods forum and adapted it herself, so it has gone through several transformations. 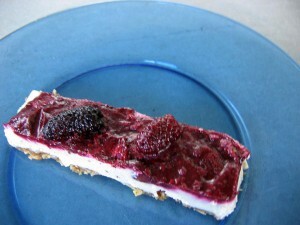 Substitute pitted cherries, blueberries, raspberries or another fruit for the topping. Substitute any nut for the crust. To make the crust, process the pecans and dates in the VitaMix or food processor, then press the crust mixture evenly into the pan with your fingers. To make the cheesecake, blend the cashews (drain and rinse first), lemon, agave (or honey), vanilla bean, salt (if using), and 1/2 cup filtered water. Add more water if needed. Don’t add too much water, or you will get a runny cheesecake and it will get ice crystals when you freeze it. Blend until smooth and thick, like a cake or cookie batter, and adjust to taste. Pour the mixture onto the crust. Remove air bubbles by tapping the pan on a table. Cover and place in the freezer until firm (approximately overnight). Remove the whole cake from the pan while frozen and place on a serving platter. Defrost in the refrigerator. • Natasha said that the original recipe called for 3/4 cup coconut oil in the filling, which she omitted. • In case you don’t have a vanilla bean, Natasha says that you can substitute 1 TBSP vanilla extract or 1 TBSP vanilla powder. • She recommends you cut a piece of parchment paper to fit the bottom of your pan to help prevent sticking. I did not use parchment paper but did not have a problem with sticking due to the natural oils from the nut and date crust. 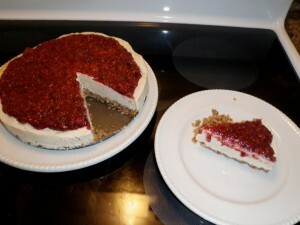 Thank you to Natasha for providing photo inspiration and the recipe on her Facebook page – my raw cheesecake came out absolutely delicious!! You’re welcome Miss Luminous! I will be making this pie again and again, it was so simple, and so delicious. The only negative is that due to all the pure organic ingredients, it was also quite pricey!! The organic vanilla beans are expensive. But since I was able to freeze it, it lasted a really long time. I can personally attest to the magnificence of this cheesecake–it’s incredible. Thanks again for sharing it with me Julie!